Are you looking for the best rimfire scopes reviews to guide you the best scope you can get? That’s not an uncommon situation to be in since rimfire cartridges like the .22LR are extremely popular. These cartridges are great especially for beginners because they’re relatively cheap, the recoil isn’t much, it doesn’t make as much noise, and rimfire rifles are also comparatively inexpensive as well. With the right rimfire scope, you can extend the range of a rimfire rifle so that you can engage in mid-range to even long range shooting. Of course, choosing the perfect rimfire scopes for yourself depends a lot on the shooting conditions you tend to be in. So to cover the bases, we have 10 of the best scopes here to showcase so that there’s at least one of them that’s ideal for your preferences. Here are the 10 field tested rimfire scope reviews to help make sure that you’re plinking and hunting with accuracy using your rimfire rifles. Plenty of experts really like the ProStaff, and it’s easy to see why. It’s extremely versatile, and you’ll find that it works great for any shooting condition you may find yourself in. With the 3x to 9x variable power, you’re able to manage medium or even somewhat long range shooting. Another way it proves its versatility is that it can be mounted on rifles other than the rimfire variety. So if you want to use this for your AR-15, you can. With 3x to 9x magnification, you’re prepared for all kinds of distances to the target. The 40mm objective lens lets in a lot of light so you can get a very clear sight picture. The fully multi-coated lens also helps to transmit up to 98 percent of the available light. The housing is nitrogen-filled and the O-ring is sealed. It comes with a BCD reticle. It’s made of aluminum, so it’s tough and durable while still lightweight. The reticle adjustments allow for quick zeroing in, which makes this great for beginners. The FOV is great at all magnifications. It comes with a BDC reticle that’s easy to view. It’s waterproof, fogproof, and even shockproof. It measures 12.4 inches, and some people may find that a bit too long. The 9x doesn’t really do much for people who don’t shoot at long range. As you may have noticed, it seems like we’re nitpicking when we came up with our list of “cons” here. That’s because there’s really nothing wrong with the Nikon ProStaff just about got everything right. This works well for experienced shooters and for beginners, so it’s basically for everyone. Leupold is famous for the quality of their products, and this is a fine example of Leupold quality. The VX-1 series may be an entry-level series of scopes, yet it’s undoubtedly fine beneath the apparent simplicity. It offers a magnification range from 2x to 7x, with a 28mm objective lens. The field of view for 2x is 46.2 feet at 100 yards, while even at 7x the FOV is still good at 17.8 feet at 100 yards. It comes with the “Quantum Optical System” that gives you a sharp image through the scope under all types of conditions. It has the Multicoat 4 that maximizes the light that reaches you eye for a clear sight image. The coating minimizes the reflections to improve the quality of the image. It also includes the DiamondCoat layer that gives enhanced abrasion resistance while also enabling fantastic light transmission. It’s undoubtedly waterproof and fogproof. It comes with the terrific 2nd generation Argon/Kryton waterproofing that’s even better than regular nitrogen. It has elevation dials that let you adjust the crosshairs for various distances and for windage too. The duplex reticle offers high accuracy for small prey. 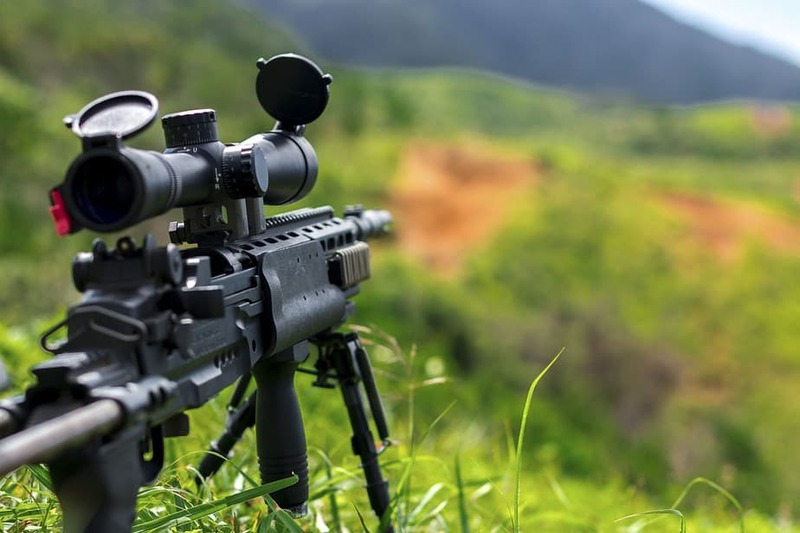 The parallax is adjusted for 60 yards, which is a typical shooting range for rimfire rifles. The scope sight image is very clear. It’s extremely lightweight at merely 8.2 ounces. It’s absolutely waterproof and fogproof. You can adjust for windage and elevation with your fingernail. The variable magnification of 2x to 7x allows for various distances that the rimfire rifles are mostly used for. The 28mm objective lens may not cut it for dusk or early dawn shooting. Since this is an entry-level scope, you may be disappointed when you’re used to the higher quality scopes that you can also get from Leupold. This VX-1 from Leupold is proof that an entry-level scope doesn’t have to offer cheap workmanship and low quality sight image. This is a truly fine scope, made for rimfire hunters looking for varmints and rabbits. It’s also quite tough, so expect to use this for a long time to come. Yes, it’s another Nikon on this list, but why should that surprise you? Nikon first made its name in the photography business and its longstanding expertise in camera lenses made it logical for them to branch out to the scope industry. This particular scope is designed for the .22 LR cartridge and built for rimfire AR platform rifles. The magnification is from 2x to 7x, so you can see your target at a variety of distances. The 32mm objective lens offers a nice compromise between light gathering capability and weight balance with the rifle. It comes with a full multicoated optical system to maximize the light transmission and the brightness of the sight image. The Nikoplex reticle and the rapid action turret system lets you hold dead-on and then adjust the elevation turret to the right range. It has a 50-yard parallax setting to correct the optical illusion at that range. You just need to dial in your subsequent ranges to make your field adjustments. The eye relief is consistent so you can still be precise even when you’re changing the magnification power. It’s nitrogen-filled and O-ring sealed, so it’s waterproof and fogproof. With variable magnification, you can see targets at various distances. The sight image is quite clear. The FOV at 2x is just 22.3 feet at 100 yards, and at 7x this drops to 6.4 feet. Some may find the 16.1-ounce weight a bit on the heavy side. This is specifically designed for your rimfire AR rifle, so if that’s what you have then this should be what you ought to get. The quality is terrific, it offers a sharp image, and you have variable magnification for distances that rimfire rifles are best used for. Using this is easy even when you make field adjustments, and it’s very durable. Bushfire is a well-known brand in the optics industry, and this is one of the scopes they offer for rimfire rifles. It’s calibrated for 38-40 grain, 22 Long Rifle high velocity loads. It’s made of high-strength aluminum alloy with an anodized-finish. It’s tough and the aluminum makes it comparatively lightweight. You get 2x to 7x magnification for seeing targets at various distances. The 32mm objective lens gathers plenty of light for a clear image without making the scope too heavy. It’s nitrogen-filled and O-ring sealed, so it’s safe from internal moisture and from dust getting in. The BDC reticle zeroes at 50 yards, and it gives you various aiming points for different distances up to 125 yards. It’s fully multi-coated, so the image is nice and bright. The fast-focus eyepiece gives you instant accuracy. It comes with a side parallax adjustment. The FOV is fantastic, as at 2x its 50 feet at 100 yards. At 7x, it’s still a nice 17 feet. It’s caliber-specific, so if you’re using the caliber it’s designed for you can rely on the accuracy it offers. It’s tough, waterproof, and fogproof. The image is quite bright and clear. The wide FOV makes it easy for you to acquire your targets through the scope. It’s a bit heavy at 19.6 ounces. You may have to grease the knobs as they’re very stiff at first. This may make it hard for you to adjust without getting off-target. 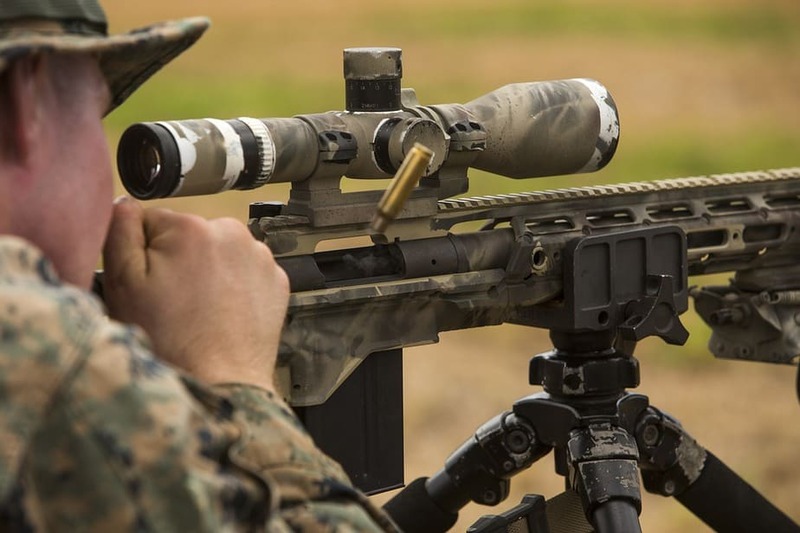 If your rifle and ammo matches what this scope is designed for, then why are you even hesitating? It’s a Bushnell, and they’ve made a scope specifically for you. That AR-15 rifle of yours will become much more accurate with this, and it even looks great too with the matte finish. The Crossfire II series from Vortex is excellent, and this particular model comes with the dead-hold BDC reticle. It’s designed not just for backyard plinking but also for hunting as well. The 2x to 7x magnification variable power lets you identify targets at ranges where rimfire cartridges are effective. It comes with a 32mm objective lens, which is a good compromise that gives you plenty of light for a clear image and without too much weight. The lenses are also fully multicoated, so they help provide the bright clear views that you will certainly appreciate. It lets you adjust for windage and elevation, and you have a fast reset function for the turrets. The fast-focus eyepiece allows you to focus the reticle easily and quickly. It’s made from aircraft-grade aluminum, and it’s nitrogen-filled and O-ring sealed. It’s certainly tough, waterproof, and fogproof. The sight picture is bright and clear. It’s very easy to use, with finger-adjustable turrets and a quick reset to zero after sighting in. The FOV is terrific. At 2x it’s 42 feet over 100 yards, and at 7x it’s still a respectable 12.6 feet. The dead-hold BDC comes with a custom hashmark design for the holdover and windage corrections. While it’s great for a rimfire rifle, Vortex didn’t make this specifically for the .22LR cartridge. It comes with removable lens covers, but they’re not the flip-up covers that you may prefer. So what if it’s not specifically designed for the .22LR? It’s great, with a really nice image quality to go along with the easy to use reticle and turrets. The 7x magnification is as clear as with the 2x. It’s designed to last for many years, and you will likely want to use it during all that time. Yes, its name suggests that it’s designed for plinking in your backyard with your .22 rifles and rimfires. But you can use this for hunting too, and its toughness can withstand rugged outdoor hunting conditions. The magnification ranges from 3x to 9x, so you’re able to sight targets at a farther distance than with just the 7x. The 32mm objective lens gathers a lot of light for a clear image, yet it’s not too heavy. It comes with a 30/30 reticle, which is basically a duplex reticle. It’s a kind of reticle that lets you know the distance to your target depending on how it appears on your scope. You also get fully multicoated optics, so the sight image is bright and clear. There are adjustment knobs that let you correct for elevation and windage. It’s waterproof, fogproof, and shockproof. It’s very light weight at just 11.5 ounces. You get a nice range of magnification levels. The sight clarity is amazing. The FOV is terrific. At 3x it’s 36 feet, and at 9x you still have 13 feet at 100 yards. It’s parallax free at 50 yards. Some people may not have much use for 9x magnification. The reticle may be a bit too simplistic for quick adjustments. Yes, this is the epitome of a basic scope for a .22 rimfire rifle. It doesn’t have much in the way of high-tech features, but then does it have to have those features when you’re just using this for your cheap .22 rimfire rifle? In the end, it’s a reliable scope that you can use for a very long while, and that’s what most people need for their rimfire rifles. This is another entry-level scope, but it’s not just any scope. It’s actually the most popular rimfire scope in the US, as it has earned thousands of reviews while other scopes can only get hundreds. Actually, it’s more accurate to say that it’s an improvement on the most popular and best rimfire scopes in America. One feature that sets it apart is the Quick Target Acquisition eyepiece, and as the name says it makes acquiring your targets a snap. It comes with the HydroShield lens coating that helps keep a clear sight picture even in harsh weather conditions. It comes with the SureGrip rubber adjustments, so that you don’t have nay trouble even when you’re wearing gloves. The 3x to 9x variable magnification allows for a bit more distance when shooting targets. It comes with parallax adjustment and the Truplex reticle. The 32mm offers a nice bright image. It weighs only 10 ounces. It’s extremely lightweight, so weight balance isn’t a problem. It’s designed to work very well even in very cold conditions. The FOV is good, with 31.4 feet for 3x and 10.5 feet for 9x. At max power, there’s a bit of a distortion along the edges of the FOV. The turret knobs don’t come with easy-to-hear clicks. This is another basic scope that works well and can last for a long time. There’s really no complication when you use this, plus it’s geared towards more extreme hunting conditions. If you’re not looking for bells and whistles but a scope you can use outdoors, then this one certainly qualifies. What if you like to try out your rimfire rifle at greater distances? If that’s the case, then you need a scope that can let you identify targets from father away. This ProStaff 4-12 x 40 certainly qualifies. The magnification ranges from 4x to 12x, so you can identify your targets from farther away. It comes with a 40mm objective lens with multicoated optics that let in up to 98% of the light for a bright clear picture. You get a BCD reticle that lets you shoot at longer ranges more quickly. It’s completely waterproof and fogproof, as it’s nitrogen-filled and O-ring sealed. It comes with support for a sunshade accessory, so you’re more comfortable for bright or rainy shooting conditions. The parallax setting is at 100 yards. Long range shooting is easier with this scope. Field adjustments are easier to make. It’s great for any sort of hunting weather condition. You can maintain your setting even if for some reason you get heavy recoil. The sight image is bright and clear. It’s a bit on the bulky side at 14.1 inches. The FOV isn’t much, with 23.6 feet at 4x and 7.3 feet at 12x. This is the scope you need when the shooting conditions are more challenging. It’s great for longer distances, and especially when the light conditions aren’t optimal. So even if you’re hunting at dusk, you can get at your target quickly even at a greater distance. This is also tailored for 2.22 rimfire rifles, and your purchase comes with the rings that make it easy to mount. It offers 3-9x variable magnification that lets you shoot at a bit farther away. The 32mm objective lens gives you ample light through the scope without being heavy. It offers a 50 yard parallax setting to counteract that optical illusion. The Magenta coating reduces reflection, and it’s fully coated. It comes with the 30/30 duplex reticle that helps you gauge the distance to the target. You can see a bit farther with the 9x. It’s easy to install with little sighting needed. It’s lightweight at just 11.3 ounces. It comes with click adjustment so you can have a good feel on the knob. It’s designed specifically for .22 bases. The FOV isn’t great, with 17.5 feet at 3x and 6 feet at 9x. At 9x the picture can be a bit dim. Quite a few people like this scope for its simplicity, even though it can be used for targets a bit farther away. It may be best for plinking in your backyard, as the FOV may make it more of a challenge to acquire your targets if they’re on the move. Admittedly, this brand is quite as famous as the others on this list. But perhaps it should be more well-known especially with this Sweet .22 scope. It’s calibrated for the 36-, 38-, and 40-grain .22 caliber bullets. The magnification ranges from 3x to 9x so there’s more leeway to hitting targets from a bot farther away. The 40mm objective lens makes this viable for lowlight conditions, as it gathers more light to brighten up the sight image. You can adjust by hand for the windage and elevation. The FOV is 40 feet at 3x and 13 feet at 9x, which is better than expected. The FOV lets you acquire the targets more easily thought the scope. You have the turrets specifically for certain grains of the .22 caliber bullets. The sight image is quite bright. It comes with fully coated optics. It’s a somewhat new brand, so you may get a stinker of a scope if you’re unlucky. The scope can be a bit bulky and heavy, measuring 13.7 inches and weighing 16.2 ounces. If you do get a good unit, you get a good scope. If you’re using the bullets for which this was designed, then you’re good to go. It’s really that simple, just as this scope is easy to set up and use. What you have to understand first of all is that there there’s no ideal best rimfire scopes that’s great for everyone. It all depends on how you like to shoot and the typical conditions in which you shoot in. What’s perfect for one shooter may not even be remotely good for another. The weight of the scope must be factored in because rimfire rifles are generally lightweight. So if you have a heavy scope, it will result in a weight imbalance in the rifle. You won’t be able to aim as accurately as you should. The rifle scope may even be used for a rimfire handgun. If that’s the case, you really can’t use a heavy scope. This weight consideration then limits the features you can get with your scope. It’s nice to have scopes with lots of extra features, but they can be impractical because of the resulting weight imbalance. It’s for that reason why most rimfire scopes are simple and basic. When you have fixed magnification, the advantage is that there are fewer moving parts and internal lenses. With variable power rifle scopes, you get greater accuracy when you need to shoot at different ranges. So if you’re very active and you bump your rifle often, you may want to use a fixed power scope. The same goes if you’re a backyard shooter and you tend to shoot at a target at the same distance each time. The variable power is better if you tend to hunt a lot so you’re not sure how far your target will be when you encounter it. You don’t really need too great a magnification power when you’re using rimfire cartridges. These bullets drop a foot at 100 yards, so they’re not exactly ideal for shooting at targets 500 yards away. So you don’t need 20x magnification, which would be both expensive and useless anyway. The standard magnification for rimfire rifles ranges from 3x to 9x. In fact, 9x may even be too much, so 7x should be fine. A large objective lens can be very useful for low light conditions, as it’s great at collecting a lot of light so that your sight picture is much clearer. But it shouldn’t be too large like 42 mm, because then it will be too heavy. This is the number of yards or feet that you have horizontally when you look through the scope at a distance of 100 yards. As a general rule, your FOV shortens as your magnification power increases. This is another reason why you don’t want too much magnification. When you have a short FOV, it’s not a problem if you’re shooting at a fixed target at a shooting range. However, if you’re hunting animals then the short FOV will make it very difficult for you to acquire your target through the scope. Rimfires are often used to hunt quick-moving targets like varmints and rabbits, so in this case you really need a long FOV. Adjust the scope should be easy, especially if you’re on a hunt. So you need to check for features that make the scope easier for you to use. At the very least, it should be easy to mount. The quality of the lens coating will affect the quality of the sight picture. Here the best option is fully multi-coated coating, which provides multiple layers of coating to all air to glass surfaces. If it’s just fully coated, then there’s a single layer on all air to glass surfaces. If it’s just multi-coated, then you have multiple layers of coating on at least one (but not all) lens surface. You can have fine crosshairs that’s great for hunting small game and for long range shots. Large crosshairs are better for large game and for close ranges, as well as in thick foliage where you need to acquire the target more quickly. The medium crosshairs is a fine compromise, and it’s best for medium-range shooting. Parallax is an optical illusion that can lead to inaccuracy. Some scopes have parallax adjustment to counteract this problem. When the parallax adjustment is fixed (say, at 100 yards) then the optical illusion is fixed for that particular distance. If it’s variable, then you can compensate for the optical illusion at different ranges. The turrets let you move the vertical and horizontal reticles so that you can adjust the impact of the bullet on the target. Some turrets can be adjusted with the fingers, whole others may need a coin. Generally, this means that it should be nitrogen-filled and O-ring-sealed. But a Argon/Krypton gas mixture may be better. Just because rimfire scopes are generally affordable doesn’t mean that you can mistreat them or neglect their maintenance requirements. It doesn’t matter how much of a discount you enjoyed for your scope. You still have to treat it right. Wipe the scope down before and after you use it. If it’s rustproof, a quick wipe-down with a clean cloth is enough. If it’s made of steel, you may need to rub it down with some gun oil. Check for dust in and around your lens, and get rid of it if you find any. If the scope is really dirty, use canned air and a small brush to get it clean. Once the dust is removed, wipe the surface with the same cleaning solution used for reading glasses. Check the turret caps and see to it that they’re snug. Inspect the ocular lens and make sure that it’s screwed to the eyepiece tightly. Look at the mounts closely, and tighten them down when they become loose. You can lose your zero if your mounts aren’t properly tight. The scope rings should be tightly clamped on. Don’t unnecessarily bump your rifle into other surfaces. That can cause the scope to go out of alignment. Use a padded bag to transport your rifle, and don’t throw gear on top of the rifle when you’re packing your stuff for a trip. If you’re hunting in winter conditions, you may want to consider using water repellant designed for scopes. Also, you should carry your rifle with the scope lens point down. The ocular part of the scope is tucked under your arm so it will remain dry. Keep your rifle covered when you store it. Why buy a rimfire scope? You should specifically by a rimfire scope for a rimfire rifle, because its features are designed to match your rifle. Rimfire scopes are usually simpler, and that’s because rimfire cartridges aren’t for very long range shooting. So you may end up with features such as too much magnification for shooting at 500 yards, when rimfire cartridges are meant for 100 yards at the most. Basically, you don’t want to waste your money. Can I use a rimfire scope for a centerfire rifle? It’s not really recommended. Rimfire cartridges generate low pressure, so there’s not much recoil to worry about. That’s why centerfire scopes usually have much generous eye relief compared to rimfire scopes. So if you use a rimfire scope on your centerfire rifle, you can end up getting your eye poked by your scope during the recoil. Some centerfire scopes may also be too heavy for a rimfire rifle. That’s not a good match. It will throw off the balance of the rifle and aiming will become more difficult. How do I mount my rimfire scope? There’s no single answer to this. The best way to determine this is to read the instructions that came with the scope, and usually the scope is designed for a particular type of rifle. You can also just go online and Google for the instructions, and usually you’ll find a YouTube video demonstrating the mounting procedure for your scope. This stands for bullet drop compensator, and you can find it in some rimfire scopes. This type of reticle has alternative circles under the crosshairs that show where the bullet will drop at certain distances. With a BDC reticle, you have an easy way of aiming your rifle at different distances from the target. Some scopes come with parallax adjustment, so “what’s parallax” becomes a natural question to ask. It’s rather difficult to explain parallax without being too science-y and technical. However, for most people it’s enough to say that parallax is a kind of optical illusion that can cause you to be inaccurate in your shooting. So which one is the clear winner? Actually, that determination is really up to you. Only you know the shooting conditions you usually find yourself in, so you should be the one to see to it that you get the right scope for those conditions. But if you’re not sure, then just get the Nikon ProStaff 3-9 x 40 Black Matte Riflescope with the BDC reticle. That’s because regardless of any shooting condition you may be in, this scope will work. Other scopes are great for certain shooting conditions, but the ProStaff is for any sort of shooting condition. It’s just that versatile, and its quality is undeniable. You can pretty much expect it to work perfectly for many years to come. It may be tough and durable, but operating it is easy. That makes it perfect for newbies. But unlike other scopes for newbies, you won’t have to buy another scope when you’ve become a more experienced shooter. It’s no secret that the Nikon ProStaff has received plenty of gushing best rimfire scope reviews. We aren’t the only people who love it. Get it for your rimfire rifle, and it’s extremely likely that you’ll love it too.